Stephen has been invisible for practically his whole life — because of a curse his grandfather, a powerful cursecaster, bestowed on Stephen’s mother before Stephen was born. So when Elizabeth moves to Stephen’s NYC apartment building from Minnesota, no one is more surprised than he is that she can see him. A budding romance ensues, and when Stephen confides in Elizabeth about his predicament, the two of them decide to dive headfirst into the secret world of cursecasters and spellseekers to figure out a way to break the curse. But things don’t go as planned, especially when Stephen’s grandfather arrives in town, taking his anger out on everyone he sees. In the first pages, we meet Stephen, a boy who is invisible. He’s lived his whole life, never being able to be seen by anyone. Not even his parents. When his mother dies, Stephen is left all alone and it’s all he knows. Until Elizabeth moves into an apartment across the hall. Because Elizabeth is unlike anyone Stephen has ever met before. Elizabeth can see him. I was very excited to have the opportunity to read Invisibility as part of the ARC tours. I’ve been looking forward to this book since the premise came out. I’m a huge fan of Andrea’s writing, and though I am still to read Bloodrose (a few people kind of spoiled the book for me. No I’m not bitter. Much. ), I really enjoyed her Nightshade series. I was also very interested in reading a duo of authors because I have read both good partnerships and bad. After all that, Invisibility left me with mixed feelings. The writing is still beautiful. Even lyrical in parts. I could feel Stephen and Elizabeth’s struggles throughout the book. Stephen is a sad creature, but also a lot happier than you’d expect someone to be in his shoes. That’s the part I really enjoyed about him as a character. You really see his appreciation for the little things in life as he works to find the best in the hand he’s been dealt. On the other hand, we meet Elizabeth. She has a few things to deal with as well. I liked her fine as a character, although her stubbornness did get on my nerves a bit. However, that could be a good thing, I’m not sure. My favorite part about Elizabeth was her brother Laurie. He was my favorite character in the whole book. His fierceness, love, and devotion is absolutely beautiful. There really should be more sibling relationships like Elizabeth’s and Laurie’s. Just saying. Overall, the book was nicely written but it didn’t have as much conflict as I expected leading into it. Sure, there are certain aspects that had to be dealt with in the story, but in the end, I felt like a bit of a let down. One big thing that stood out is that there was no resolution at the end of the book. Well, maybe a tiny little one, but not really. Is this book part of a series? For some reason, I thought it was a stand alone and if that’s true, I’m not sure how I feel about it even more. 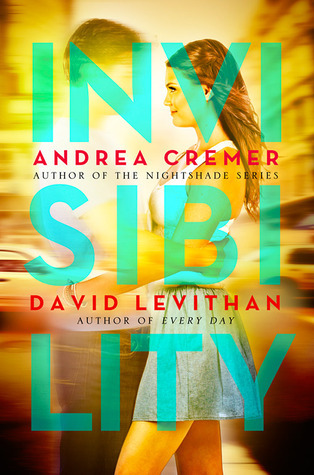 If you enjoy the writings of Andrea Cremer and David Levithan, you will enjoy Invisibility. There is just something beautiful about love that over comes obstacles, whatever they are. Invisibility comes out May 7th, 2013!